During my years in exile in Pennsylvania (2006-2009), I had the opportunity to become fairly immersed in the Philadelphia visual arts scene, and it was there that I met Philly artist Frank Hyder, who has subsequently become a good friend. At the time Hyder was a very well-known and highly respected Philly area painter, and as a member of the faculty at the Moore College of Art & Design, he was also one of the pillars of the Philly area academic world, which was quite an accomplishment in that area, as it seems that there is an University or College every other block in the City of Brotherly Love, and most of them are highly respected and enjoy stellar reputations. A couple of years ago, Hyder retired from Moore, and I cannot recall ever seeing a lifestyle change create such a powerful impact upon the career of an artist! It is clear that the freedom found by Hyder (at least in having more time to paint and create) had a spectacular effect on his artwork - the man attacked his artistic life with a ferocious attitude that should be an example to all of you approaching the latter third of your life. Don't get me wrong... prior to the retirement from Moore, Hyder was not one of those faculty types who rely on their tenure for job security and seldom (if ever) actually create and exhibit work. In fact, quite the opposite... Frank Hyder was exhibiting all over the place, mostly via art fairs and the "Giants in the City" installations. The man has had 80 solo shows in his career! But retirement gave Hyder the opportunity to focus all of his time on the rediscovery of previous undeveloped ideas and the creation of new, fresh ones, and this is what makes the Frank Hyder of 2014 a refreshing, post-academia artistic example for a lot of artists, not only trapped in the academic world, but also trapped in a vicious circle of creative neutrality. "Frank Hyder: Afterglow" is currently on exhibition through 9 April at the Rebecca Hossack Gallery in New York City and this exhibition is a brilliant example of what I mean in the previous paragraphs. A few decades ago, Hyder pulled his family from the then pretty rough Northern Liberties neighborhood where they lived in Philly, and for a few years lived in Venezuela. The influence of this life-changing event left a profound mark on the artistic footprint of his work, as well as his personal life (Hyder is perfectly fluent in Spanish and I suspect that many people who chat with him in Spanish may think that he is one of those millions of South Americans of German ancestry). At the Rebecca Hossack exhibition, Hyder showcases his newest work in the series that is usually described as his "koi fish series." It is much more than that. 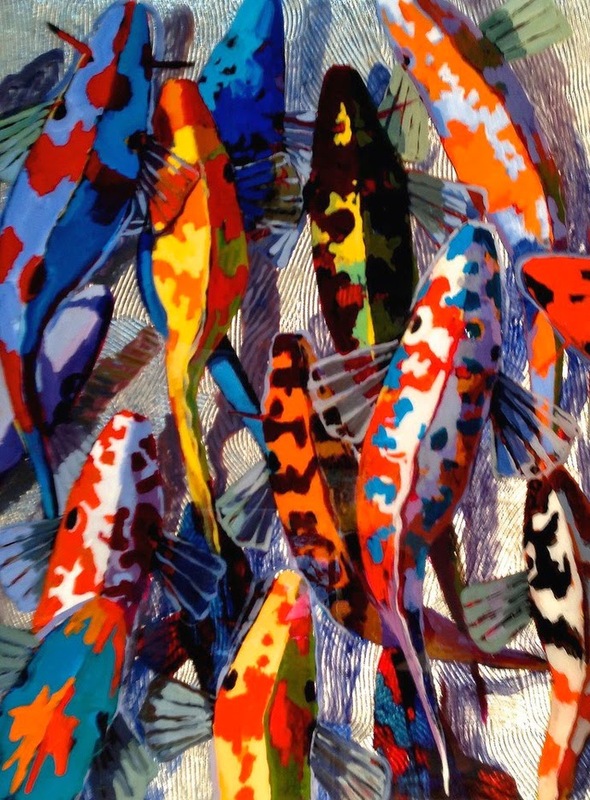 Via the focus on the koi fish, Hyder manages to flex his enviable printmaking skills, marry them to his equally talented painting skills, and (as if that wasn't enough) he then brings in an unholy assembly of acrylics, resin, metal leaf, oils, etc. to deliver a final product that has evolved from the subject to deliver what can best be described as a dance of color and movement and eye-fooling depth of field. Look at "Harvest Run" as an example... and yes, there are koi fish, and yes they are the apparent focus of the piece. But is is the color, and it is the movement, and it is the depth created by the thickly-grooved metal leaf that hypnotizes the viewer in both visual punch and scale (48x36 inches). Also on exhibit are several of Hyder's works from his "Luminaries" series. In this distinct series, Hyder pushes his development even further by integrating light into these electrical pieces. He has now made electricity a component of his work, and in doing so, he integrates a fourth dimensional element that really works well as an example of a liberated artist pushing the limit of the gallery walls. Concurrent with this solo exhibition, Hyder will be participating in the Big Egg Hunt New York, a charitable endeavor benefiting New York City children through the Studio in a School initiative and endangered Asian elephants through the Elephant Family organization. Other participating artists and designers include Jeff Koons, Leo Villareal, Julian Schnabel, Marchesa, Terry Richardson, Bruce Weber, Tracey Emin, and Tommy Hilfiger. "Frank Hyder: Afterglow" runs through 9 April at the Rebecca Hossack Gallery, 262 Mott Street in New York City.